While Disney films from the 1970's are typically defined by goofball comedies that weren't particularly funny or memorable, there are a few exceptions. Producer Bill Walsh chose to adapt a book called Scandalous John by Richard Gardner that was a Western retelling of the classic Don Quixote. The screenplay was written by Bill Walsh and Don DaGradi (the duo behind Mary Poppins and The Love Bug). Robert Butler returned to direct his third film, a big departure from his other Disney work (The Computer Wore Tennis Shoes and The Barefoot Executive). Brian Keith returned to the studio after 6 years away. This is his final Disney film, although he did return for a TV movie in 1986 called The B.R.A.T. Patrol. His sidekick Paco is played by Alfonso Arau, his first of two Disney films. The rest of the cast are mostly unknown actors, but Harry Morgan (The Barefoot Executive) is in this and would become one of the most frequently used character actors at Disney for the rest of the decade. John Ritter appears in his second and final Disney film (The Barefoot Executive) before becoming a household name on Three's Company. Famous songwriter Rod McKuen wrote the score and song "Pastures Green" for the film. Filming took place from September to December of 1970. Most of the filming was on location in Alamogordo, New Mexico, with interior scenes shot in Arizona's Old Tucson Studio. They also travelled to South Dakota to shoot the railroad scenes. John McCanless was once a great rancher, a hero in his Western town. But after the loss of his wife, he began to lose his mind with delusions of grandeur. He hires an illegal immigrant named Paco to be his ranch hand and their adventures include trying to block a plan for a dam that would flood his property (real), fighting off an indian attack (delusional), leading a cattle drive (real... but with only one cow) and finding the legendary golden city of Quivera (delusional). They are followed by John's granddaughter Amanda, who is worried about her grandfather's health, and Barton Whitaker, the man trying to stop him from getting the money to save his ranch. In an accidental shoot out, John is fatally wounded and by poetic happenstance, it happens under a sign that reads "Quivera." Scandalous John was released on June 22nd, 1971 in a limited release. It is unknown why the studio would want to limit the exposure of this obviously expensive film (shot on location in multiple states in Cinemascope). 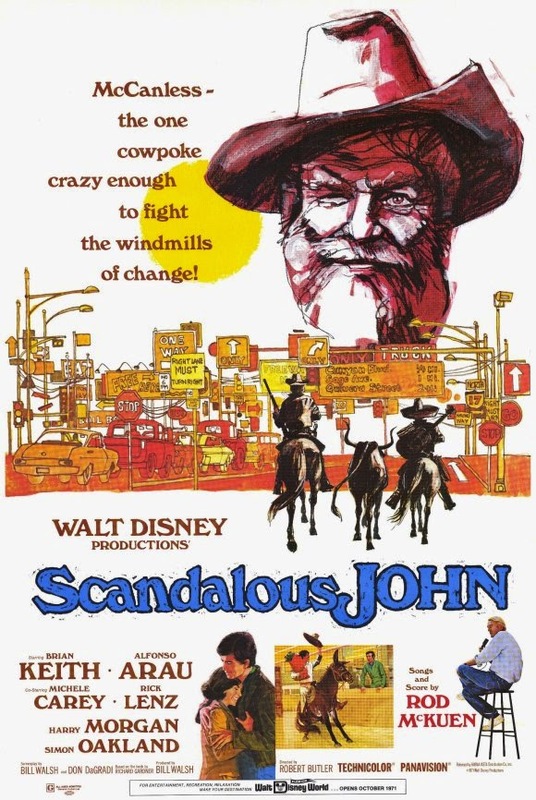 Even more curious for a Disney film that didn't make money in its theatrical release, Scandalous John never aired on The Wonderful World of Disney. It wasn't seen again until 1986 when it was released on home video to rental stores. Was Disney trying to hide Scandalous John? And if so, why? It was made at a time when the story of Don Quixote had renewed interest thanks to a Broadway musical that opened in 1965 called The Man of La Mancha. By 1971, United Artists was working on a film version, so perhaps there was some agreement that Disney would limit the exposure of Scandalous John so that audiences wouldn't be tired of the story. This is all speculation on my part because I can't see a reason why Disney would make a high quality film like this and then not give it a proper release. If they were concerned about the brief racial undertones (there's a scene where Paco is almost deported), they could have easily edited those out. Brian Keith gives his finest performance of any of his Disney work in this film. John McCanless is quite a character and his performance is consistent throughout. With his beard, accent and gruff voice, he's actually hard to recognize as the dad from The Parent Trap. The film has a slow pace, but the cast is so likable that it's easy to forgive as the story unfolds. There are also some genuinely funny moments, such as John and Paco riding horses through a Main Street full of cars and riding them into stores to shop. It's a rare gem in a decade full of mediocre and forgettable films. Scandalous John is available on DVD as a Disney Movie Club Exclusive where it is presented in its Cinemascope widescreen ratio of 2.35:1. It was released in 2009 and received a gentle restoration then, but has excessive grain. That same restoration is used for digital HD versions of the film, but for some odd reason Disney chose to crop it to a standard widescreen ratio, meaning you are missing lots of picture on the sides. It's a confusing choice that I can't understand and as a result, the DVD is the version I recommend.